I have one problem. When I simulated schematics with AD8475, on out i get voltage 2.5kV. I think spice-model AD8475 aren't correct. Are you can check this spice-model? 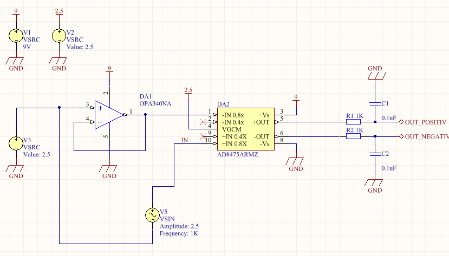 RE: AD8475 using IN 0.8x for aditional low pass filter? Doesn't anybody know about this AD8475? Can you tell me what are you trying to do? Do you want to import the AD8475 on the specific simulation tool or platform? What simulation tool are you using? I believe the AD8475 should be available in Multisim and Simetrix. Where should the -Vs pin of AD8475 be connected to? RE: ADA4932-1/2 use as Funnel Amplifier.